I'm a huge fan of Rachel Vincent's Shifters series and I can't even tell you how much I'm enjoying being back in that world seeing glimpses of characters we already know and love while at the same time getting to know a whole new pride of werecats. 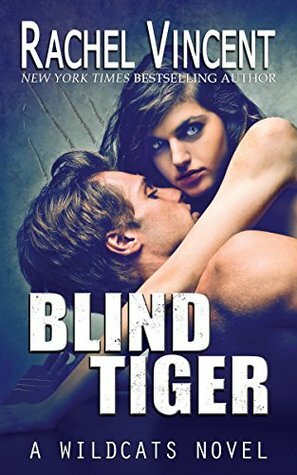 Blind Tiger picks up Robyn's story a couple of months after the ending of Lion's Share, her secret is out and she's been placed under house arrest as punishment for killing the human hunters who were tracking her and Abby. She's supposed to be learning how to control her new cat instincts and she's also undergoing contestant medical tests as they try to figure out how she was able to survive to become the first female stray in America. Robyn knows she agreed to her punishment (it was that or have her claws cut off and her teeth removed!) but she's so tired of being trapped inside and constantly monitored whatever she's doing. The last straw is when she hears several of the Alphas discussing which of their sons should get the chance to be her husband, she wants to go back to school not get married and start popping out little shifter babies. Titus has spent years trying to turn the strays from the Mississippi free zone into a genuine Pride and he takes his Alpha responsibilities very seriously. He has been working alongside Jace, Abby, Faythe and Marc to get the Alpha Council to recognise them as an official Pride so that his men will have the same rights and opportunities as all the other werecats but a lot of the Council are old and stuck in their ways and it won't be easy to get them to accept a stray Alpha. When Robyn escapes from her house arrest by sneaking into his car she makes his goals even less achievable. Robyn begs him for protection, something he has promised to all strays in his territory, but if he doesn't return her then the council won't just refuse to acknowledge his Pride, they'll also go into full out war to get her back. This was another great instalment in the Wildcats series, I loved seeing how Jace and Abby are getting along and I really enjoyed getting to know Titus and some of his enforcers. So many great characters and I really hope we're going to get stories for all of them eventually (even though that could be difficult considering the severe lack of tabbies in this world!). Robyn has been through a lot since she was turned and it was no surprise that she was rebelling against the way the Council were treating her, the old guard are so traditional that it would drive me insane being under their control and this is totally outside of Robyn's comfort zone. Titus is stuck between a rock and a hard place, by helping Robyn he would be risking everything he's worked so hard for and the lives of the rest of the strays under his protection but if he doesn't help her then he'd be turning his back on a stray that desperately needs his help. Add in the mystery of someone who is deliberately breaking the rules and making new strays at an increasingly high rate and Titus has his work cut out to keep peace in his territory. I have to admit I'd guessed who was behind that mystery very early on, there weren't that many suspects after all, but I still enjoyed seeing Titus and Robyn try to figure things out. Their romance was great too and I loved seeing how they dealt with the Council. Robyn was willing to make a difficult sacrifice but they also had a lot of friends working with them and I think the Council is going to get a real shake up over the next few books. It's great to see Pack politics going through some much needed changes and I'm excited to see where the series goes from here.